In our team, we have developed several kinds of simulators of QCLs, ranging from the most detailed and most computer consuming Monte Carlo method to simplified rate equation models which allow fast systematic computation for engineering purpose and from which one can derive analytic expressions for compact models or equivalent circuit modeling. 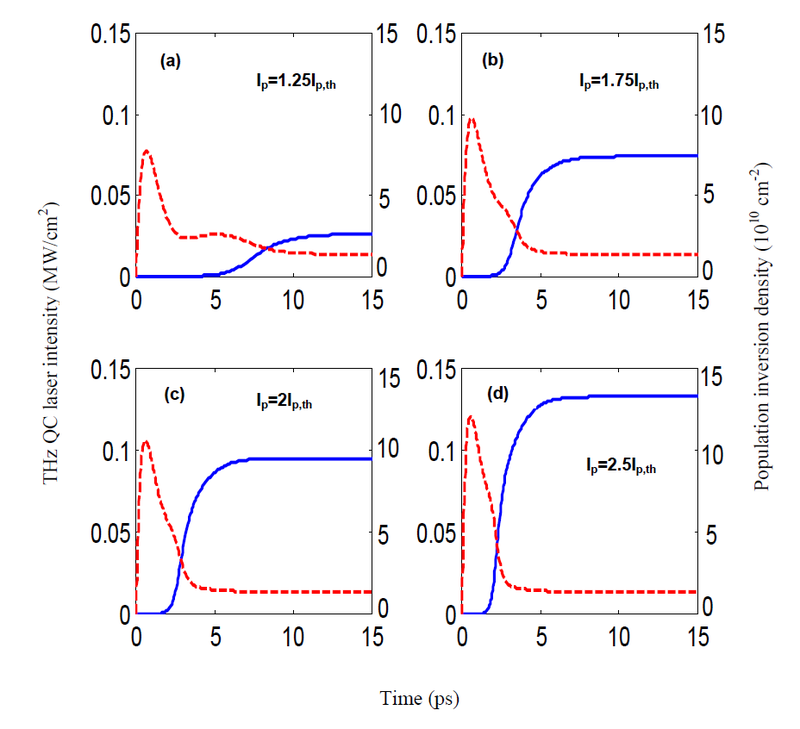 In recent years, we mainly worked on such simplified models, in collaboration with our colleagues from Sétif University in Algeria and applied them to systems derived from QCLs and aimed at room temperature THz emission. Quantum Cascade Lasers (QCLs) have proven as extremely valuable compact sources, especially in the terahertz range. Unfortunately, in this range of frequency, the need of cryogenic cooling severely limits practical applications. Room temperature operation at terahertz frequencies seems beyond reach for ‘standard’ QCLs. However, several systems derived from QCLs have been proposed to overcome this limitation. An example of such systems is the ‘optically-pumped electrically-driven QCL’, which retains the cascade scheme in a periodic structure under the action of an applied electric field, but uses optical (rather electrical) pumping to ensure population inversion. 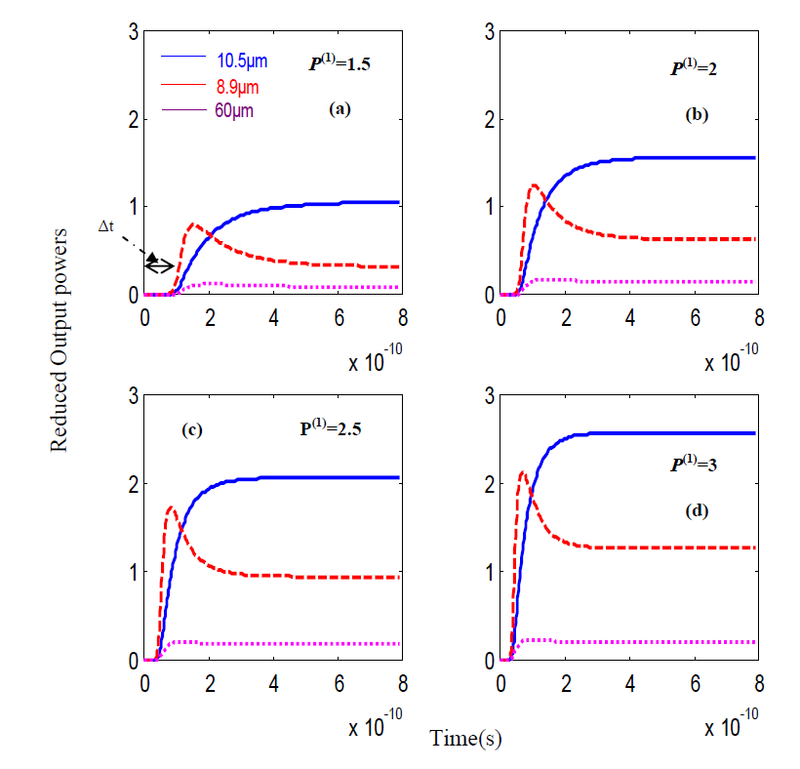 We developed a simplified 4 levels rate equations model of such systems and obtained closed-form expressions for steady-state characteristics (populations, mid infra-red pump threshold, external optical efficiency) which bring into light the dependencies on device parameters. On the same premises we also investigated the dynamical behavior of this device, which depends on pump intensity but appears in general faster than conventional QCLs. However, to date, the most successful compact sources for THz generation at RT are based on difference frequency generation. We applied our ‘simplified rate equations approach’ to the study of static and transient dynamics of such systems and get analytic expressions for time dependence of important characteristics such as levels populations and generated THz power. Schematic conduction band energy diagram of two stages of a THz QC laser based on the optically pumped electrically driven scheme. Solid arrow: Pump absorption, dashed arrow: Pump recovery. (a) Cross sectional view of the THz DFG device showing schematically the two parts of the active region. (b) Four-level model of one stage of the bound-to-continuum active region in a dual-wavelength QC laser as used in our work. Lasing takes place simultaneously through transitions from 4 onto 3 on one hand and from 4 onto 2 on the other. 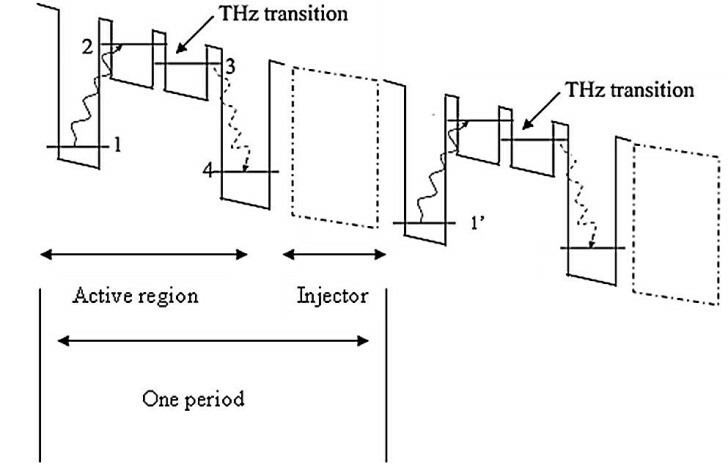 The THz frequency (60 µm wavelength) is generated via DFG process between levels 3 and 2.